Monnit has created a custom sensor notification that is frequently used in commercial refrigeration monitoring. 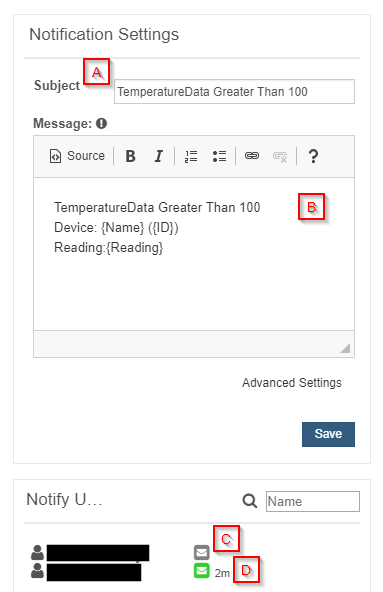 This custom notification allows you to receive an alert when the temperature has changed for a set amount of time instead of sending the alert based on a single reading. This helps prevent false alerts in commercial refrigeration applications. In order to use this custom alert, first make sure that the settings are correct on the temperature sensor(s) you will be using. To modify the settings, select the name of the temperature sensor in the sensor list then choose the "Edit" tab. From the sensor edit page, we need to make sure that the settings will work for our notification. 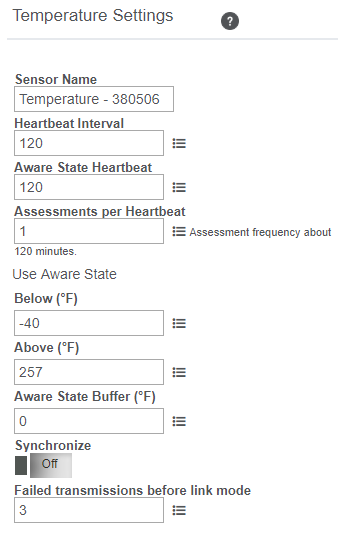 For iMonnit Premiere accounts, you can set the aware state heartbeat to as quick as 10 minutes, if using the basic "free" monitoring, this defaults to your standard heartbeat. With these few things set, we are now ready to create our notification. Select "Events" in the main navigation menu. A list of previously created events will display on the screen. From here, you have the ability to filter, refresh, and add new events to the list. Note: If this is your first time adding an event the screen will be blank. Select Sensor Reading from the drop-down menu. A second drop down menu will appear. From here, you'll be able to see a list of the different type of sensors registered to your account. Choose Temperature in the drop-down menu. Next, you'll be asked to input the trigger settings. You have the option of setting this trigger for greater than or less than a temperature reading. 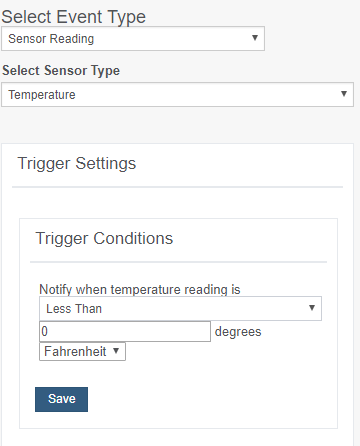 If you don't have a temperature sensor, the option in this example won't be available. select any variable output sensor and follow along. Variable output sensors can have multiple events triggers created. Example: A temperature sensor used in a freezer. You may want to be notified if the temperature goes below 0° or above 30° Fahrenheit. You would create two events. Event 1-Trigger Set for temperatures LESS THAN 0° F.
Event 2-Trigger set for temperatures GREATER THAN 30° F.
The Event Information page has a series of tabs across the top. History: A table of all past alert notifications for this specific event. Schedule: Here you can schedule the event only to be active at certain times or certain days. Trigger: This is where you can review your trigger settings. Actions: Where you set the action you want to happen when an alert state is triggered. The Trigger Sensors section sits below Trigger Conditions. If you have multiple sensors for the same type (Example: five Temperature sensors), this is where they will be listed. There should be at least one sensor in this section. By default, the sensor(s) will not be assigned to the event conditions you've just set. To assign a sensor, find the device(s) you want to designate for this event and select. Selected sensor boxes will turn green when activated. Choose the sensor box again to unassign the sensor from the event. Continue toggling the sensor(s) corresponding this new event until you are satisfied with your selection. These can be adjusted later by returning to this page. Click the Add Action button under the Event Information header and available action types are presented in a select list. Notification Action: Specify account users to be receive notification when this event triggers. System Action: Assign actions for the system to process when this event triggers. Save button commits any changes to message content fields. Click the icon next to a user to configure how they will be notified. Choose if you want notifiation sent immediatly when triggered or if you want a delay before it is sent and press Set. A green icon indicates the users that will receive the notification. A gray icon indicates the users that will not receive the notification. If a delay has been selected, the delay time will display beside the icon. Sensor notifications for your commercial refrigeration unit should now be set.